The Security Council today expressed grave concern over what it said was a serious deterioration of the economic and humanitarian situation in Yemen amid worsening security, including the threat from Al Qaida in the Arabian Peninsula. In a press statement, the Council urged all parties in Yemen to ensure that those in need of humanitarian assistance can be reached, voicing concern over the increasing interruption of the flow of basic supplies. The United Nations body also urged all parties to refrain from targeting vital infrastructure. The Council also called on all parties to urgently seek a solution to the crisis in an inclusive, orderly and Yemeni-led process of political transition that meets the needs and aspirations of the Yemeni people for change. It took note of the inter-Yemeni efforts in that regard, saying the Gulf Cooperation Council’s (GCC) initiative continues to be important. Members of the Security Council welcomed the efforts of the Good Offices of the Secretary-General through his Special Adviser, Jamal Benomar, and those of the GCC. The statement was issued following a briefing to the Council by Mr. Benomar. Civil unrest in Yemen has escalated this year, as it has across much of North Africa and the Middle East, with often bloody mass protests by civilians calling for political reform and greater democracy. 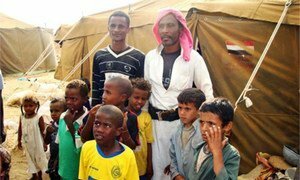 The number of people in need of humanitarian assistance in southern Yemen is on the rise as a result of the continuing conflict, which has forced hundreds of thousands of people out of their homes, the United Nations reported today.